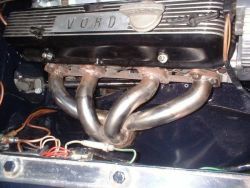 My car was previously fitted with the restrictive tubular manifolds that pass between the engine block and the chassis. These were small diameter (35mm OD), and followed extremely tight bends. 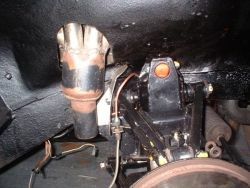 The obvious solution was to use the 38mm OD MG RV8 style manifolds which pass through the inner wheelarches. I bought a set of these and cut the holes in the wheelarches and found the clearance between the collectors and the chassis rails was only 1/4 inch. 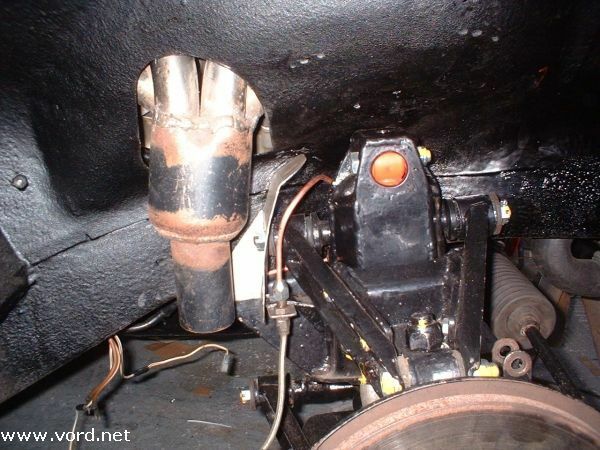 I returned the parts, and faced with big holes in the wheelarches decided to make my own custom headers. I carried out a few calculations and found that the best place for the collector would be just at the corner of the chassis rail. 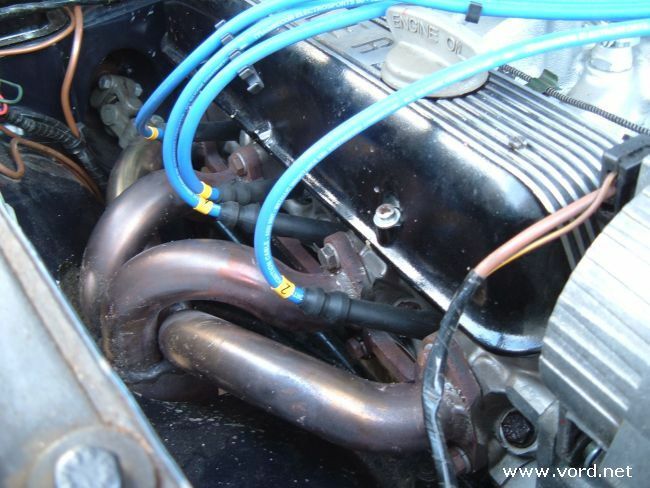 With the collector in this position the header lengths would be tuned to act as an extractor manifold increasing torque at 3500rpm. The package didn't allow the collector to be placed in this position so I used the standard RV8 position in the wheelarch. 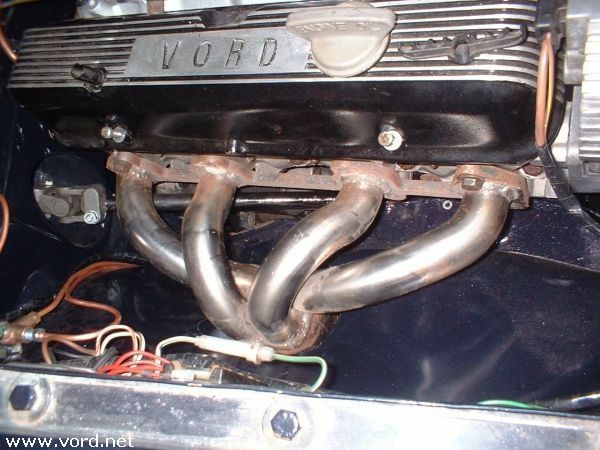 I used 38mm OD tube for the headers rather than the larger 42mm OD to maintain fast gas flow and aid torque. The headers are made from 304 stainless steel. The tubes were bought pre-bent in a single radius, and each branch is made up of up to 3 separate pieces welded together then polished. I couldn't find a suitable collector in stainless steel so I resorted to a mild steel collector. 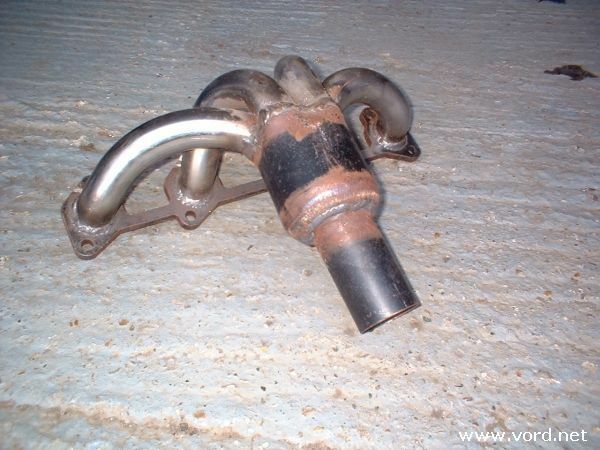 The collector is an important part in exhaust design for performance. It is important that the entrance to the collector is at least 6 times the diameter of each header, and that the collector is a reasonable depth. I used the largest header that would package in the wheelarch space. The wheelarch package is now very tight - I have increased the width of the upper suspension arms and added an exhaust manifold that wasn't originally there. There isn't a lot of room for the brake pipes in particular so I've made a heat shield to save them from the worst of the heat from the manifolds. Here's something I forgot to take into account. 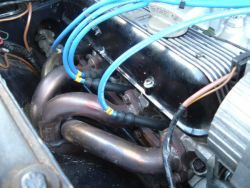 The rise in the manifold as it exits the ports should be very good for gas flow, but it does bring the pipes much closer to the spark plug leads. I think my original set of plug leads broke down due to the heat - see engine problems. I've fitted a set of Magnicor leads which are supposed to be more heat resistant. So far so good, but at £100 a set I really should buy some of that Demon Tweeks spark plug lead thermal insulation.